Confession: I can tolerate some pretty mediocre coffee. I'm sipping a K-Cup right now. I grew up in the south drinking Waffle House coffee that had scorched on a hot plate since the last shift. And Waffle House was considered "the good stuff." So I'm the farthest thing from a coffee snob you'll ever find. I just want to wake up with something warm in a cup. But I do have taste buds, and I do enjoy something more than a tepid vehicle for caffeine delivery. So when the Breville YouBrew arrived, I wondered—could this be the effortless, excellent cup of coffee I've always casually pursued? A $280 countertop coffee maker with a built-in grinder and a thermally sealed carafe. The type of moron who'd incinerate a Bialetti, trade it in for a leaking, lame DeLonghi, and realize too late that the so-called coffee in the house now all tasted like a half cup of Starbucks topped off with hot water. Bulky, tall, shiny, steel. Smooth mechanics. Sweet LCD display. Pour in beans, add water, select an intensity and hit start. Measurements are automatic. Getting it right without knowing what the hell you're doing. Pouring in some fancy beans and actually being able to detect "harmony of caramel" or "toasted walnuts" or whatever. The carafe, which stays warm and scorch-free, has a sharp, narrow rim around the entire opening. You can never completely pour out all the coffee or water, and cleaning it without a long-handled brush is impossible. The brushed steel on the machine and the carafe shows every fingerprint—and every drip of coffee. Didn't fridge designers figure out the fingerprint issue about five years ago? Tested since Labor Day using Brazilian Ipanema and Nicaraguan Los Altos beans (a seasonal blend by Joe the Art of Coffee), and also Trader Joe's Bay Blend. The carafe stays warm for an incredibly long time. 12 hours is no problem. A cup consumed 24 hours later (don't ask) actually tasted fine. The burr grinder is quite loud. An Amazon reviewer clocked it at 80 decibels (8 shy of a Dyson handheld vacuum). That carafe rim spills water as you fill the machine, and that stainless steel shows every little streak if you don't wipe it all up. Cleaning the gold mesh filter and its lidded receptacle also requires work with a bristly brush. There are 7 intensity settings, but the sweet spot is either the second-most-intense one, or just one notch shy of that. You can also set it up so it brews directly into your mug. Not having to measure beans (or basically think at all) really helps us coffee imbeciles. This is a hell of a lot of money for a coffee maker. Even at $180, it'd be a pretty major investment, but you could probably squint your eyes and say, eehhhh...ok. But at $280? You're squarely into the "let's just put this on the wedding registry and see what happens" territory. If it were this machine versus almost $300 bucks in my pocket, I'd probably still be drinking bad coffee. If I wanted to treat myself, I reckon I'd go to Waffle House. Now, if you are somehow able to get this fine machine home and still afford to eat for the rest of the month, you will no doubt be satisfied by its performance. This is perfect if you have the money, but you don't have the time to pour 204-degree water over a paper cone full of precisely ground, Sumatran-grown, Brooklyn-roasted, buck-an-ounce super beans. The YouBrew has probably cranked out about 20 pots of coffee now, and it's been flawless each time. If it can last another two years at this pace, then you could look back and feel fine about the investment. But with anything this pricey, even with a one-year warranty, you just feel like such a sucker if something goes wrong. 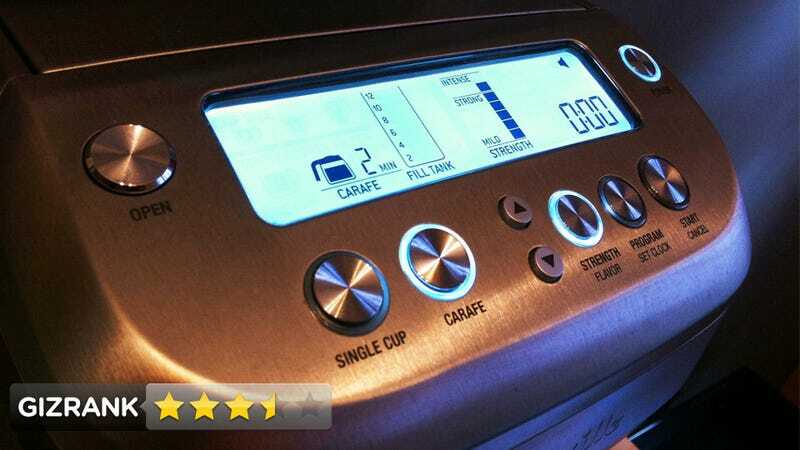 Our test of the best automatic coffee maker proved that a quality machine doesn't come cheap. And compared to a cheap one, even by my crude standards, the Breville does make a profound difference in what you're drinking every morning.